The front of the case has not changed at all. It is still has a nice clean front that has aluminum plates mounted on a plastic panel. I do wish that Phanteks would have given the aluminum a brushed look as that looks better when using aluminum. The front of the case features Three (3) 5.25″ drive bays. 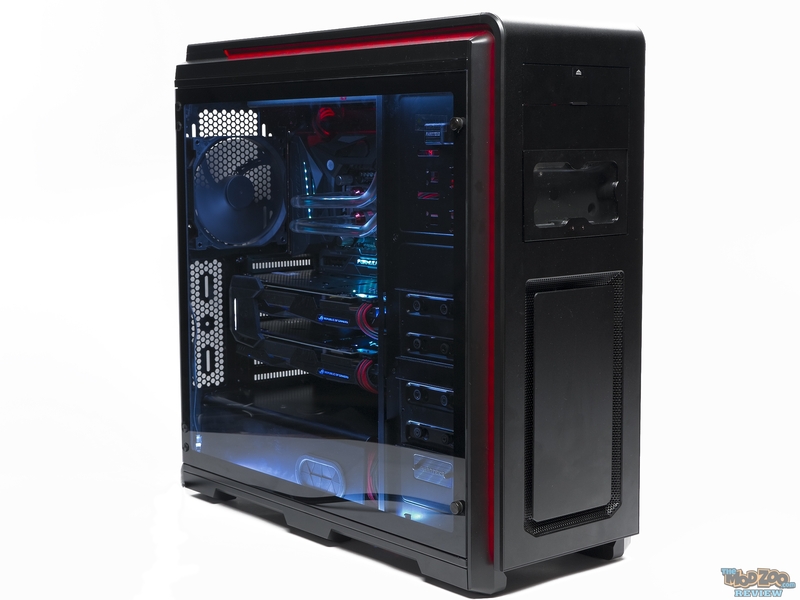 The top bay cover conceals the front I/Os of the case along with the RGB LED controller. The back side of the case has not changed as well. The back side panel is made from steel, and is held in place by using couple thumb screws. It’s nice to see that Phanteks is using rubber padded thumbscrews, to avoid any damage to the paint on the case. Note: Unlike some other cases, the side panel does not slide back for removal. The Luxe panel is easier to take off if you just swing it out, right after taking the thumb screws off. The back of the case is very clean, and again, it stays the same. The back of the case allows you to mount a 140mm or a 120mm fan (a 140mm fan is included with the case). Like almost all Phanteks cases, the back of the case has a spot for you to mount a reservoir in the back. The case also has Eight (8) PCIe expansion slots, so, if you want to run a build with Four (4) GPUs, go right ahead. The side of the case features a really nice, smoked tempered glass panel. The panel sits flush, and is held in place using a couple hinges in the back, plus Two (2) foam backed thumb screws in the front. To make sure that you can open the panel without any difficulty, Phanteks put in a spring to push the panel out a bit. Here is how the case looks with the side panel swung open. I love the fact that Phanteks implemented a nice hinged glass panel on the Luxe. But, now I’m sad as the Evolv TG did not get the same treatment. Here is a closeup shot of the hinges that they used. These are the same hinges that we have seen in the original “classic” Evolv ATX. Since the side panel sits flush with the side of the case, and there is no handle to pull on, Phanteks has added the spring loaded pin to aid in opening the TG side panel. The bottom of the case has three (3) rubber padded feet on each side, to make sure that they do not scratch you tables or any other surfaces. The case also has Two (2) filters on the bottom of the case. The first is a PSU filter that can be accessed from the rear, and has ventilation for long PSUs. The second is a filter to cover the bottom 2 x 120mm/140mm fan mounts, and is accessed from the front. The front panel can be removed by tugging it from the bottom (after you take the front filter out). The case includes 2 x 140mm fans in the front. NOTE: Before you go and pull the front panel off completely. Keep in mind that there are Two (2) cables for the front panel RGB LEDs that need to disconnected. You can do that by un-plugging two LED header plugs from the back side of the case (right side panel needs to be off to access that). The top of the case features a big mesh panel just like the Enthoo Primo. The RGB lit power button is on the top as well as a HDD activity light. The top panel can be removed by pressing down on the rear of the panel (stickers mark the area). Once the back pops open, you can slide the panel back and out. With the top panel removed, you can see there is plenty of room to have fans mounted right under the panel. The case comes with a 140mm fan pre-installed in the top as well. The top of the case can hold 3 x 140mm fans, or 3 x 120mm fans. Flipping open the top bay cover reveals the front I/Os on the case. The case has couple USB 3.0 and USB 2.0 ports in the front. You also get your standard audio ports, followed by the reset switch. The last button is your LED controller, which cycles between Ten (10) different colors and modes.